Gahr High School’s Jacob Faria has a 14-4 record for the Tama Bay Rays’ AA franchise Montgomery Biscuits. When Jacob Faria graduated from Gahr in 2011, his numbers spoke volumes, regardless of how quiet the Gladiators ace was. In a three-year prep run, Faria went 18-2 on the mound with a 1.72 earned run average and 122 strikeouts. The 6-foot-4, 205 pound right-hander was selected in the 10th round by the Tampa Bay Rays in the 2011 amateur draft. 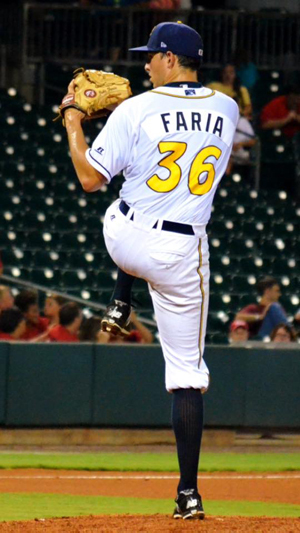 For nearly four years, Faria spent most of his time in Rookie and High-A ball throughout the Midwestern and Southern states. Everything changed in 2015, though, when Faria, 22, had the most wins in professional baseball at the all-star break. At 10-1 and a 1.33 ERA, Faria got the call two days after the break and was promoted to the Rays AA franchise in Montgomery, Alabama. He started 4-3 with a 3.20 ERA for the Montgomery Biscuits, and a combined 14-4 mark this season. Despite being just 22, Faria is old fashioned in his demeanor, beliefs, character and giving back to society as a whole. Faria spends a lot of time at Gahr in the offseason, working with younger players, especially pitchers because Gladiators’ head coach Gerardo Perez and assistant Jose “Pep” Miranda were such big influences in his evolution on and off the mound. Among those who know him, Faria is as revered for his generosity and unassuming nature as he is admired for his on-the-field talent. Faria won the 2014 Erik Walker Community Champion award for giving back to the people of Bowling Green, Kentucky. One of the many instances that earned him the award was meeting five-year old twins Tripp and Trace Cunningham at a Friday night game. The twin brothers asked Faria if he and a couple teammates would come to their game at 9 a.m. the next morning. Without hesitation and despite not getting home until midnight after a Biscuits game, Faria, and teammates Oscar Hernandez and Juniel Querecuto made the 30-minute drive to cheer on the Cunningham brothers. After the game, all three players spoke with kids, took pictures and signed autographs. Earning the Walker accolade made it possible for the Rays to send $2,500 to Faria’s favorite charity that helps fight and funds cancer research for children. Faria credits his entire family for the remarkable young man he’s become, especially his father David and his late grandfather, Joe Faria. Joe Faria emigrated to the U.S. at age 17 from Portugal in 1959 without a dime to his name and unable to speak a word of English. Sadly, his grandfather died in February of last year at age 70, but Faria said he has a lifetime of memories and lessons from his grandpa. David Faria has made several trips to the South to see his son play, including every opening day, and as proud as he is of his son’s progress on the mound, it’s what Jacob Faria is off the field that has his father beaming. While in some ways mired in Single-A baseball the past several seasons, Faria came to a decision that would change his career just by watching major league pitchers on television. Faria has three pitches (fastball, curve and change) and his fastball is consistently between 90-93 mph, and he considers his change-up his “out pitch”. 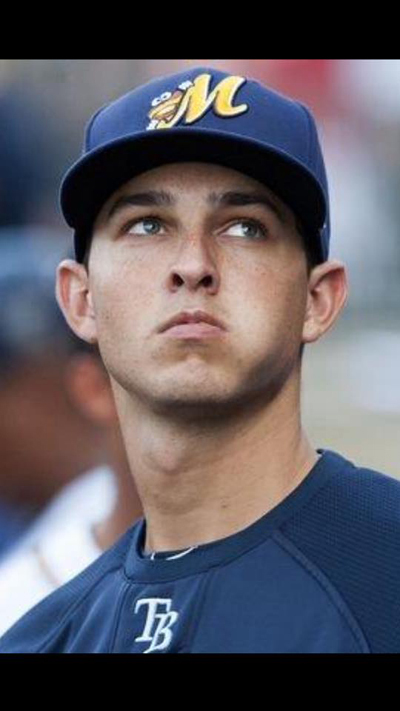 While his dream is to one day stand on the mound at Angel Stadium for the Rays in front of family and friends, one thing he can already be sure of is the impact he’s had on teammates (past and present) and more importantly, the children of America. **He’s been dating longtime girlfriend, Jessica Soto, who played softball at Gahr. She attends Long Beach State. **His two grandfathers emigrated from Cuba and Portugal, and both made successful lives on their own. ** Double-A ball players make $1,400 a month after taxes. ** Players pay $12 a day at home games for laundry and food provided in the clubhouse. They get a per diem of $25 a day on road trips. **Faria has played games in: Florida, West Virginia, Alabama, Kentucky, Virginia, Wisconsin, North Carolina, Tennessee, Iowa, Ohio, Indiana and Mississippi. ** The longest bus ride was 12 hours from Bowling Green, Kentucky to Appleton, Wisconsin. ** As of Aug. 21 his team holds a three-game lead in the Southern League’s Northern Division over the Birmingham Barons (White Sox Double-A affiliate) with three weeks remaining. ** Has been an all-star in both Low-A and High-A ball. ** Received MVP from Princeton Rays at the Minor League Awards night at Tropicana Field before the Rays game in Sept. 2013. ** Faria credits Poway resident Dom Johnson, his personal pitching coach, with his ascendance in 2015.